Or should I say, still #Charlestonstrong. 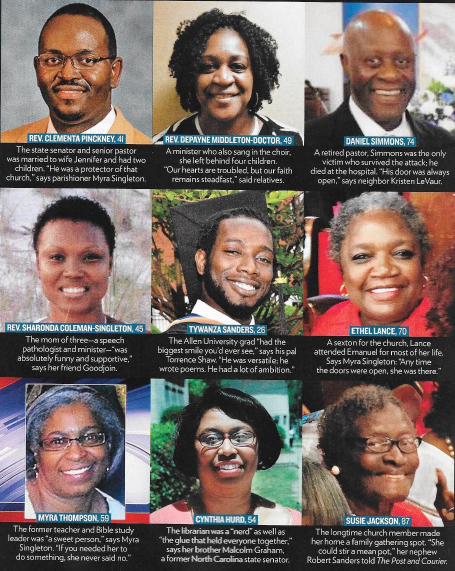 1 year ago today: June 17th, 2015 ——- 1 man took the lives of 9 people (and injured others) at the Mother Emanuel AME church. No one would have ever imagined the chaos that reigned that night. I know I sure didn’t. I was working late, overseeing a banquet function at the hotel I was currently working at in Mount Pleasant, with no idea the chaos that was happening on Calhoun St, Downtown Charleston. It wasn’t til I got home that I found out about the tragedy that had befallen on my city. I don’t have cable, it’s expensive but mostly because it’s just too depressing (case in point here) but my fiance told me about it and online it was overwhelming with the swarming, frantic noise of ultimate disbelief, utmost sadness, justified anger, and sorrowful tears. Also, this act of unbelievable violence was WAY too soon after the shooting of Walter Scott in April up in North Charleston. 2015 was NOT looking like a great year. I’m not going to go into great depth about what happened. For those who are interested, Time Magazine did a full feature for the Emanuel 9 that is worth the read: How do you forgive a murder? As all 9 lives that were senselessly taken and greatly pained the Charleston community, 1 in particular hit a bit more home for me. Cynthia Hurd was my head manager/librarian at the St. Andrews branch of the Charleston County Public Library, a library that I practically visit once a week or two if not more. Someone I had recently seen maybe a week or 2 prior to that horrible night. Despite the pain and grief that overwhelmed our city, Charleston did not give into the hate that it certainly would have been justified for. There were no riots. There was no large acts of violence that we see after a catastrophe such as this of late. Instead, Charleston embraced it’s nicknames of the “Holy City” and “2nd Brotherly City of Love.” There were prayer vigils, candle lighting, memorials, flowers and cards and plush animals overwhelmed the sidewalk of Mother Emanuel AME Church, fundraisers, assistance funds and scholarships emerged. On June 21st, a unity rally was held on the Arthur Ravenel Bridge. It is said that there were over 20,000 people standing side by side, on the bridge or underneath at the Mt. Pleasant Memorial Waterfront Park, holding hands in the summer heat, celebrating and mourning those whose lives were taken from them in a place of peace, a place of worship. I unfortunately was unable to attend, but seeing the helicopter view and pictures taken on the bridge of attendees made me extremely proud of my city.